If you are planning to get your hands on a tablet then you might have got confounded by the three giants of gadgets’ innovations this year. 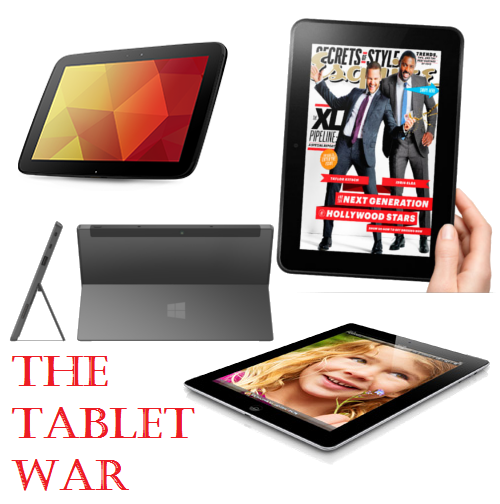 Google’s nexus 10, Apple’s ipad 4 and Microsoft’s surface tablets have been among the most desirable tablets lately. Each one having its own highly developed features has garnered real thirst for gadgets from people. Hey guess what! You’re at the right place at the right time to decide your pick out of the three. Here’s a complete review of the three tabs on different parameters. The dimensions of the three tabs are pretty much the same with nexus being 264x177x8.9mm, surface being 244.5×171.9×9.3mm and ipad4 being 241x186x9.4mm in size but in terms of weight, Nexus 10 (603g) is the lightest of the three, being the most convenient one to hold in hands. But, ipad4 (652g for Wi-Fi model & 662g for 4G version) and surface tab (676g) are more hard-wearing than nexus having metallic body while nexus 10 is made of plastic. The additional point where an ipad4 gains is that its shell is a bit more mark immune than surface tabs. The nexus 10 tab claims to possess 9 hours of battery life with “text, graphics and sound use” while the ipad4 tab even surpasses it by providing 10 hours of battery life over Wi-Fi. The surface tab holds its rank below both nexus 10 and ipad4 by just giving around 6.5 hours of battery usage. There’s a very stiff competition between nexus 10 and ipad4 when it comes to screen resolution. Nexus 10 provides the best display currently on a tab because of its 10in 2,560×1600 resolution 299ppi. It claims to give a flawless screen ever presented in a tab while ipad4 is also quite close with its 9.7in Retina LED-backlit widescreen display, 2048×1536 pixels which give an indistinct clarity. But after comparing the two very minutely, nexus 10 still beats ipad4 by providing sparkler rich resolution and vividly lively images. Beaten by both of them, the surface tab’s 10.6in touch screen, 1,366×768 pixels gives less lucidity and brilliance than both of them. All the three tabs support Wi-Fi network and provides Bluetooth 4.0 service but an edge where ipad4 leads the pack is that it provides 3G and 4G network possibilities which are not found in nexus 10 and surface tabs. Nexus 10 runs on Android 4.2 Jelly Bean, ipad4 supports iOS 6 and surface RT tabs feature Windows RT. Ipad4 provides a number of apps that are basically augmented for tablet usage. Android 4.2, on the other hand, provides a swarm of exclusive and convincing services especially the several users’ profile support, gesture typing etc. However it is crucial to be noted that the operating system renders one end to the user support and the other end is provided by the apps meant for the operating system. Surface RT tabs have a full package of services and features for professional users that is offered on windows RT which is an exposed type of windows 8. For business people especially, windows RT come with features like office 2013. People can generate and manage word documents, excel sheets etc. while moving. Ipad4 features 5-megapixel iSight rear camera, plus front-facing camera, nexus 10 has 5MP rear and 1.9MP front and surface RT possesses 720p HD front and rear cameras. Both nexus 10 and ipad4 have somewhat similar picture quality while surface RT ranks below both of them giving not so good images and the cameras are just fine for video calling purposes. The picture quality is enhanced in normal light in both nexus 10 and ipad4 but in low and bright light conditions both perform uselessly. So if a user is prompted to use his tab as a camera, then he can go for ipad4 and nexus 10 though they don’t offer great image quality like smartphones but they are still better than surface RT tabs. Ipad4 is available in three selections 16, 32 or 64GB while nexus 10 has 16 GB or 32 GB and surface RT has 32 GB or 64 GB selections. An additional feature that surface RT has is a microSD card slit which allows users to load large files of music, video etc. I.e. a user can expand memory beyond 64GB in a surface RT tab. Nexus 10 costs around $319 for the 16 GB type and $389 for the 32 GB type. Surface RT costs nearly $399 and ipad4 costs around $479. There are a lot of great features offered by all the three tabs. Apple ipad4 provides great clarity in presentation, alert and firm performance, and great battery backup and carrying convenience. But, it lacks USB support, stereo speakers, micro SD card slot and other basic apps such as calculator and clock etc. While Google nexus 10 is the finest android tablet presently existing, giving great performance and has one of the clearest displays presently on a tab. But at the same time, it doesn’t have 64GB selection and the camera doesn’t work well in dim or bright light. Surface RT tabs possesses lightweight, tough build, ingrained office 2013 but lacks support for 3G and has not so good camera.